Conventional medicine has told millions of people living with autoimmune disease that their only options are a lifetime of harsh medications that may or may not mask their symptoms, and that can carry side effects worse than their disease itself. But it doesn't have to be this way. You CAN reverse your autoimmunity and reclaim your health and vitality by addressing the true underlying causes of autoimmune disease, using simple and proven dietary and lifestyle changes. I have seen the success of this protocol firsthand, in my clinic and as a patient myself, and now readers everywhere get the benefits of this medical breakthrough. Considered the definitive guide to reversing autoimmunity, The Autoimmune Solution lays out a revolutionary, step-by-step approach that restores the body to its natural healthy state in 30 days by eliminating toxic foods, introducing restorative ingredients, and identifying environmental toxins. Get your copy of the New York Times bestseller that has empowered over 100,000 people to reverse their autoimmunity and take back their health! "I was diagnosed with Lupus in 2007 and in 2011, I started getting joint pain in my hands and shoulders. My doctor put me on plaquenil. I bought The Autoimmune Solution in May 2015, started a gluten free/paleo diet, and got off medication. My joint pain went away, I ran my first 5k in December 2015 and did a Spartan race in March 2016. I have never felt better. Thank you so much Dr. Myers!!!!" Customize your supplement protocol with this simple guide! Learn which supplements to take, where to get them, and how to take them. Watch the top five interviews with leading autoimmunity experts from my worldwide summit to learn innovative strategies and practical tips to address your root causes. $75 IN FREE BONUS GIFTS! After the 30-day program, learn how to safely reintroduce foods and add more variety into your diet with this handy companion to The Autoimmune Solution! 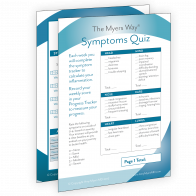 Record your symptoms and track your weekly progress as you reduce your inflammation! These delicious smoothie recipes are packed with essential nutrients to support your gut and immune system! May we send you health tips and special offers? Or stop by your local book store! "I was diagnosed with Wegener's Granulomatosis over 2 years ago. I have been on high levels of prednisone and other steroids ever since. Since starting the program 5 weeks ago, my C-Reactive Protein levels dropped from 57.3 to 15.3. Another inflammatory marker dropped from 57 to 36. The results are amazing and continuing to go down! 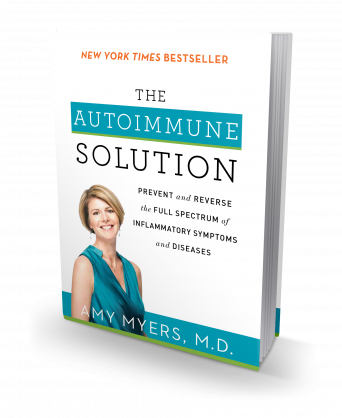 My rheumatologist was thrilled, I would recommend this program to anyone with autoimmune disorders." "This book is a must read if you have inflammation problems, skin disease, or allergies. I've suffered from numerous allergies and a chronic skin condition, since I was a little kid. For over three decades I used steroidal medicine to alleviate the symptoms. Last year, I learned that I could treat the cause, not the symptoms from The Autoimmune Solution. I started with going gluten-free and dairy-free for 30 days. Amazingly, just by doing that I was able to get off the medicine I used since I was thirteen. The good results motivated me to keep pushing forward, so I did the full 30-day meal plan in the book. I am glad I did. After 30 days, I woke up one day, and I had no joint or muscle pain in my body. "I can't recommend Dr. Myers highly enough! I did The Autoimmune Solution program, and it helped me learn how I came to get PCOS and then MS and that I was high on the autoimmune spectrum. It's very educational, and it helps you reverse and halt your illness through diet. I have managed to come off 15 prescription drugs in total now, no more fatigue, less pain, no eczema or asthma, no IBS or UTI's--generally I am so much healthier!" 15 days after starting the program her symptoms started to disappear, and by the 30-day mark they were completely eliminated. She was able to return to work full-time, come off of her medications, and go on her first vacation with her husband since their honeymoon! I am so much healthier! 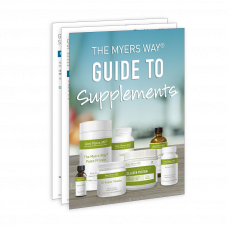 Amy Myers, MD has helped tens of thousands of people restore their gut health and reverse chronic illness as a renowned leader in Functional Medicine. She is a 2x New York Times Bestselling author of The Autoimmune Solution and The Thyroid Connection, and the founder and medical director of Austin UltraHealth. She has been featured on The Dr. Oz Show, The New York Post, Women’s Health, Huffington Post, GOOP, and numerous other television programs, radio shows, and print publications.